Onion Tomato Gotsu or simply called as Thakkali Kosthu is a side dish that’s served with idli and dosas that’s popular in my native Kumbakonam and Tanjore. 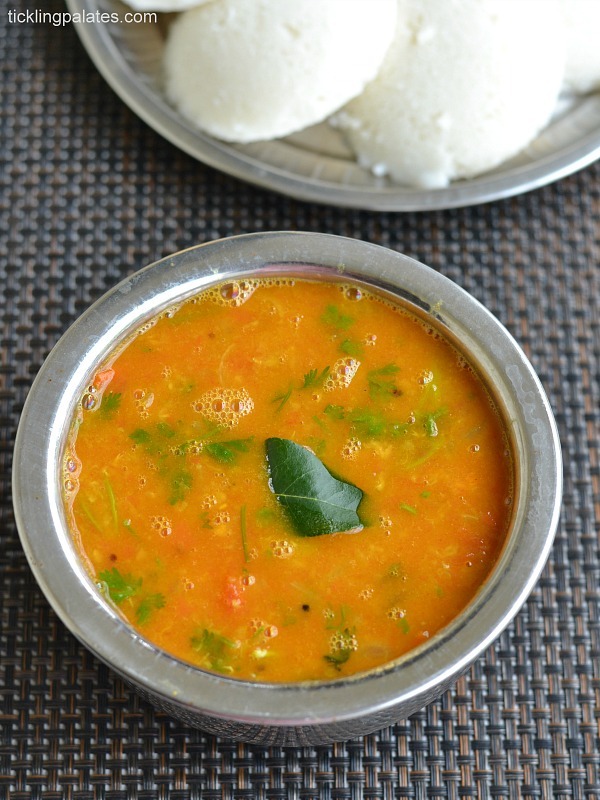 Some also call it as Quick Thakkali (Tomato) sambar as it gets done very quickly especially when you have guests at home and this one can feed a crowd. Although myself and the others at home prefer to have Hotel Tiffin sambar with idlis, I prefer making this kosthu during weekdays as it gets done in no time while maintaining the sambar taste as well. There is no need to grind any spices to make this gotsu and it is also not thick as the tiffin sambar or kumbakonam kadappa. This kosthu is watery like it should be so as to get absorbed well by the idlis or dosas that we serve it with. Don’t use it with rice as it won’t taste right. Always Use standard variety of tomatoes (Naatu Thakkali) to make this gotsu and not the the hybrid ones (Bangalore Thakkali). Though traditionally paasi paruppu (moong dal ) is used to make this kotsu, you can also use toor dal instead or a combination of both. While using toor dal,make sure that you cook for an extra whistle as the time taken to cook will be longer than when you cook moong dal. 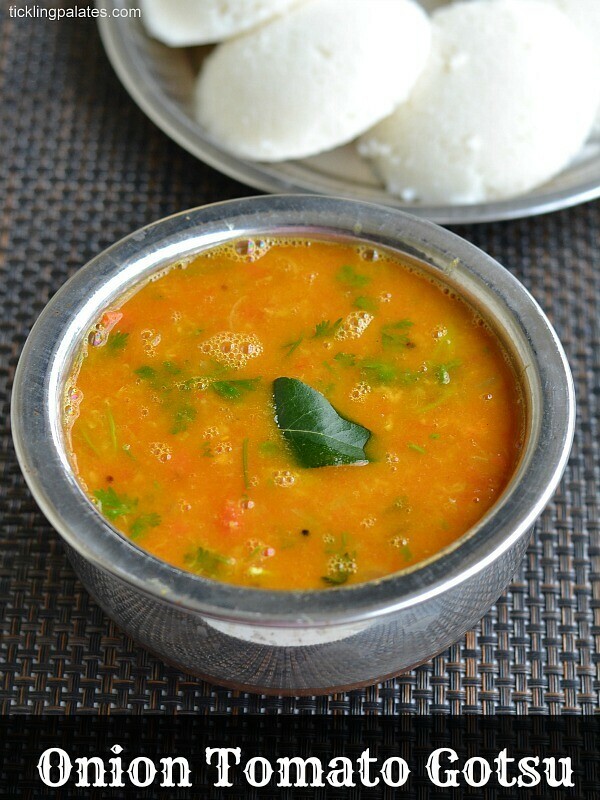 Onion Tomato Gotsu that is served as side dish with idli and dosa. 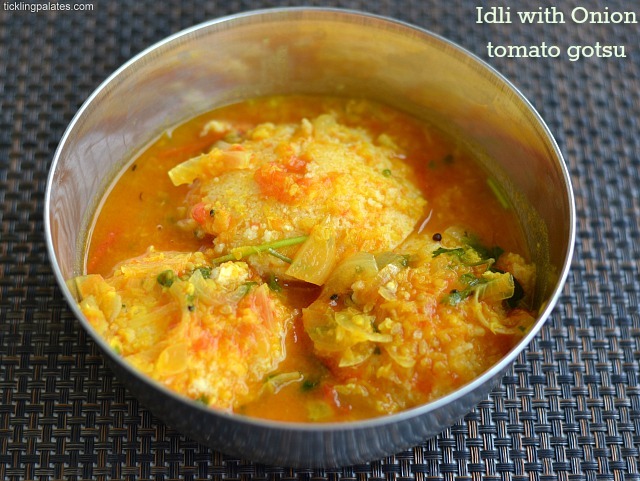 Wash moong dal and tomatoes. Halve the tomatoes. Place both dal and tomatoes in a pressure cooker and add 1-1/4 cups water and pressure cook for 2 whistles. Wait for the pressure to release. After you open the cooker lid, you can find that the skin of the tomatoes have come loose. Just peel them away and discard. Mash the dal along with tomatoes with a masher or pappu guthi and keep aside. Chop the onions finely. Cut the green chilies into 3 or 4 pieces. Heat a pan with oil. Add mustard seeds and let it splutter. Add onions, green chilies, curry leaves and sauté till the onions turn translucent. Add the mashed tomato and dal mixture to the pan and further add 3/4 to 1 cup water to the consistency you want the gotsu to be. Add salt, turmeric powder, sambar powder, mix well and let it come to a boil. Simmer the flame, add coriander leaves and let it cook for 4 to 5 mins. Onion tomato gotsu is ready. 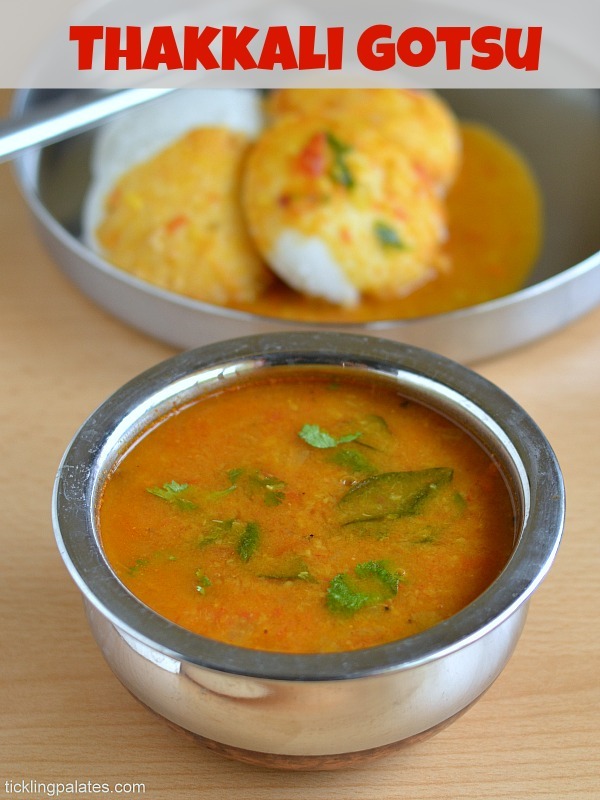 Serve piping hot poured generously over spongy idlis or crispy dosas. I too make this gotsu, but without the moong da. Urs look very tempting, got to give ur version a try. Thanks for sharing. I love gothsu with idli more than tiffin sambar.. Love your version, looks delicious. The idlis dunk in gothsu is very tempting! Never heard of this till date Radhi. But it looks mouth watering. Finally, i have one more side dish recipe for my dosa. Was an excellent side for my crispy rava dosa. Everyone in the family loved it. I don’t have a pressure cooker, so I boiled the moog dal separately first. I also added some termarind in the end. Turned out well.